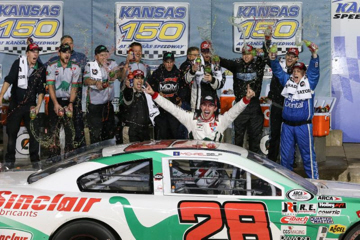 MOORESVILLE, N.C. (Oct. 23, 2017) – MDM Motorsports ended the 2017 ARCA Racing Series (ARS) Presented by Menards season on a high note on Friday at Kansas Speedway with driver Michael Self winning the Kansas 150. Zane Smith finished third, and Sheldon Creed dominated the 150-mile event but blew a tire with three laps to go and finished a disappointing 19th. The win was Self’s first-career ARS victory and marks the team’s fifth ARS victory of the season with five different drivers. In addition to the win, the Mooresville, N.C., organization won the General Tire Pole Award with Smith. Creed qualified second, and Self started his winning drive from the eighth position. MDM Motorsports scored victories at Talladega (Ala) Superspeedway with NASCAR Camping World Truck Series driver Justin Haley, Toledo (Ohio) Speedway with 2017 NASCAR K&N Pro Series East Champion Harrison Burton, Michigan International Speedway with NASCAR XFINITY Series star Brandon Jones, Winchester (Ind.) Speedway with NXS driver, Kyle Benjamin, and now at Kansas Speedway with eighth time NASCAR K&N Pro Series West (NKNPSW) winner, Self. Michael Self, driver of the No. 28 Sinclair Oil Chevrolet… Self entered the final ARS event of the season coming off two consecutive NKNPSW victories at Meridian and Roseville. The 27-year-old Utah driver qualified the Sinclair Oil sponsored machine eighth and spent most of the event in the top-10 despite fighting a very tight race car. Working with Harrison Burton’s 2017 NKNPSE championship team led by Mardy Lindley, Self continued to fight. He restarted sixth on the final restart and held off NXS driver Ty Majeski to score a dramatic win for MDM Motorsports and Sinclair Oil. Zane Smith, driver of the No. 41 ICON Vehicle Dynamics Toyota… Smith joined MDM Motorsports at Salem Speedway and nearly won the race after starting from the General Tire Pole. He was able to score another General Tire Pole on Friday beating his teammate Creed and for the fourth event in a row, the 18-year-old driver had a shot at the victory. Midway through the 100-lap race, Smith fought an ill handling race car, but he and his No. 41 ICON Vehicle Dynamics team led by Jamie Jones made the right adjustments, and Smith was able to rocket back to the front with a chance to win on the last restart. He finished third and locked up a top-10 ARS points position, finishing ninth in the overall standings. Sheldon Creed, driver of the No. 12 United Rentals/A.M. Ortega Construction Toyota… Alpine Calif., native Creed had a breakout season in both NKNPSE and ARS competition despite his terrible luck. Once again, Creed appeared to have the car to beat, leading a race-high 52 laps and racing in the top-five all night. On the final restart, contact with another competitor resulted in a flat tire relegating the two-time SPEED Energy Stadium Super Truck Champion to a 19th-place finish in the ARS season finale. For more information about MDM Motorsports, including driver development opportunities, please visit www.MDMMotorsports.com.